Avril - Ultraviolet, Bleu Azur Irisé & Mille et Une Nuits! Hi guys! 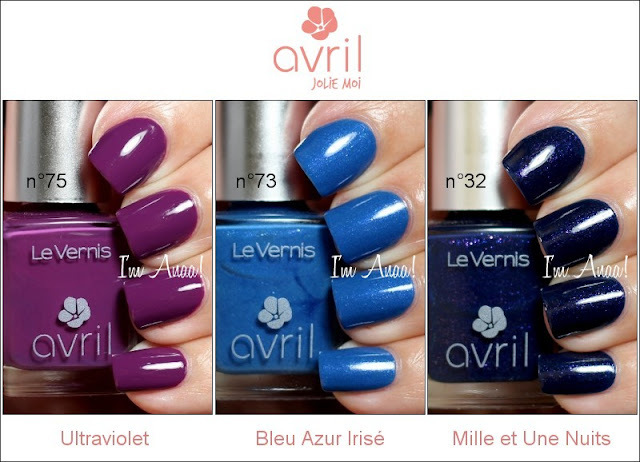 Today I have 3 Avril polishes to show you! About a month ago, Avril started following me on Twitter and it reminded me that I bought 3 polishes from them last year but they were still untried, forgotten in my Helmer. So I took them out and placed them on my desk so I don't forget to swatch these pretties. I finally found some time yesterday, so here they are. Ultraviolet (n°75) is a gorgeous purple creme, nearly a crelly. I applied 2 coats for these swatches and 1 coat of KBShimmer Clearly on Top. Thanks to a perfect formula, the application was really easy, one of the easiest application of my life actually. Bleu Azur Irisé (n°73) is blue with blue shimmer and almost a one coater! I applied 2 coats for these swatches and 1 coat of KBShimmer Clearly on Top. Amazing formula, easy application. Mille et Une Nuits (n°32) is a dark blue crelly with pink and sapphire blue shimmer. I applied 2 coats for these swatches and 1 coat of KBShimmer Clearly on Top. Application wasn't as easy as the other two, but still a great formula. Avril nail polishes are 7-free. They retail at 2,80€ for 7mL and they are available for purchase on avril-beaute.fr. They ship to several European countries: France, Belgium, Luxembourg, Swiss, Germany, Italy, Spain, The Netherlands, The UK, Portugal, Denmark, Ireland and Austria.